Mamfredas Resort is a private complex measuring 5,000sqm, consisting of eight, luxury two storey villas in the cosmopolitan resort of Tsilivi. 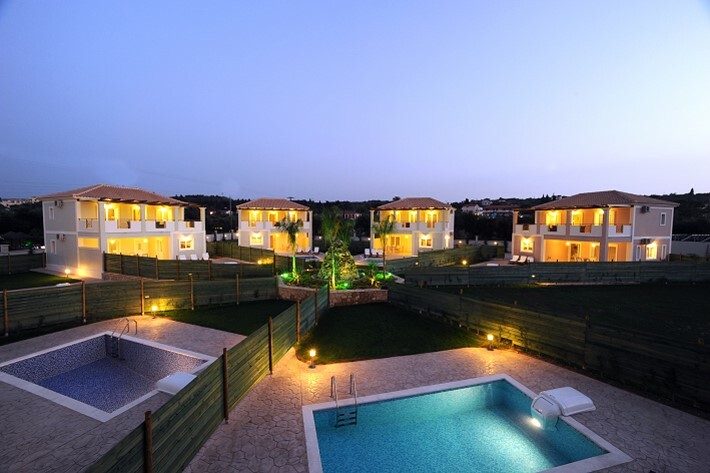 The unique construction and design of the villas offers complete privacy, each having their own swimming pool, parking and gardens. The villas are set just 50m from the gorgeous sandy beach and a short stroll will take you to the centre of the resort where you will find a wide selection of restaurants bars and shops. Mamfredas Resort is the perfect choice for families or groups of friends seeking a luxurious, relaxing holiday. 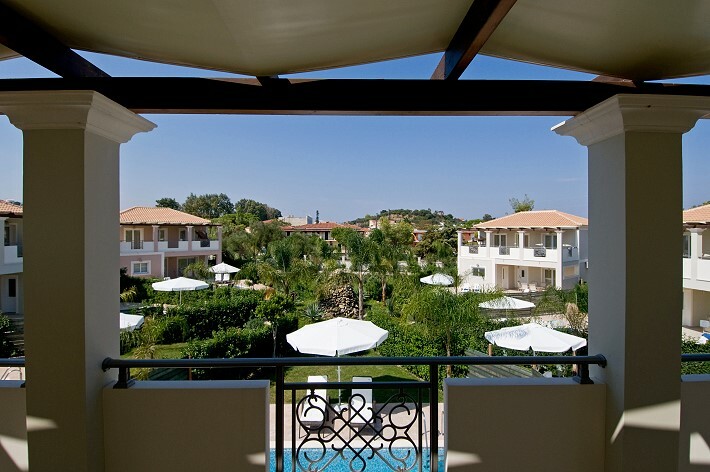 Mamfredas resort consists of eight spacious two storey villas stylishly decorated with modern amenities. 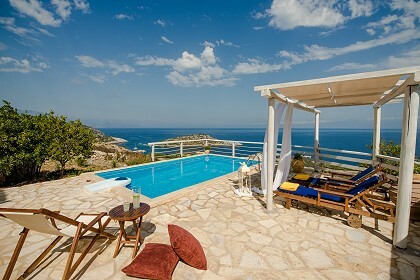 Each villa has three bedrooms, decorated throughout with modern colours and furnishings and can accommodate 6-8 persons. The ground floor has a lounge with comfortable sofas, air-condition, 42in flat screen television and stunning decoration. The lounge leads to the open plan kitchen and dining area which is fully equipped with superb facilities including, dining table and chairs, full size cooker/oven, full size fridge/freezer, washing machine, dishwasher, tumble dryer, microwave oven, kettle, toaster and all utensils you will require. The ground floor also has a bedroom with double bed with ensuite bathroom and a separate family bathroom with bath and hand held shower. 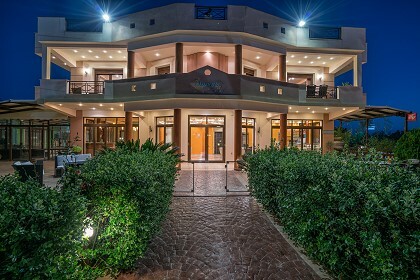 All the villas have spacious balconies and verandas furnished with quality patio furniture and sun loungers; private swimming pool, private garden, four air-conditioning units, flat screen televisions with six international satellite channels and all Greek national channels, WiFi broadband internet plus laptop computer on request. Mamfredas resort welcomes their guests to their beautiful homes with superb facilities and features, making these villas an excellent choice for a memorable holiday. Features include private swimming pools with sun loungers, private gardens, fully equipped kitchens, air-conditioning throughout, satellite television in lounge and bedrooms, wireless and standard internet connection, washing machine, tumble dryer, dishwasher, communal barbeque, daily cleaning, private parking and all close to the beach. Mamfredas Resort is located in the popular resort of Tsilivi on the North east coast of Zakynthos, which is 5km from the capital of the island and 9km from the airport. Tsilivi is set amongst olive groves and vineyards and has a wonderful golden sandy beach that is continually awarded the Blue Flag for cleanliness and shelves gently into the sea making it ideal for children. 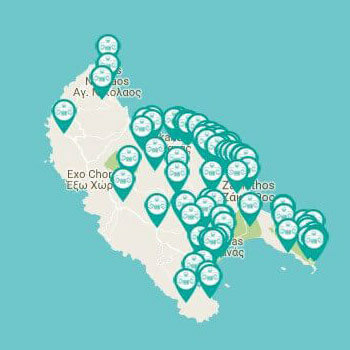 There are numerous tavernas serving traditional Zakynthian cuisine, restaurants, bars and many local shops to explore. The resort offers a warm and friendly atmosphere and this combined with the natural beauty of Greece and the guaranteed weather makes it the perfect destination.